Intex Technologies has launched its latest 4.1 channel speaker, IT-Star 14000 SUF. Priced at Rs. 10,500, the speaker has a 100W + 18W output power and comes a full function remote control. It also comes with a cordless mic with digital mic volume and ECHO sound. The speaker is equipped with a USB port, SD card slot, Bluetooth connectivity, and a built-in FM tuner. It comes with a wooden body and has a plastic panel. 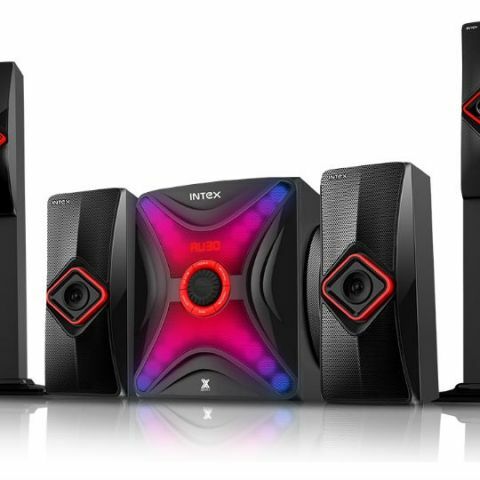 Intex Technologies, leader in the speakers segment in the Indian market, today launched its latest offering from the 4.1 Channel Speakers range - IT-Star 14000 SUF. The all new IT-Star 14000 SUF speakers is a powerful innovation. The spectacular 4.1 channel speaker sports a USB port, SD card slot, Bluetooth connectivity and a built-in FM tuner. The speaker comes with AUX Audio input compatible with DVD/PC/LCD TV. “Intex Technologies has always kept the consumer in mind when designing its products. We have been successful in delivering innovative products which continue to delight consumers . The Star - 14000 SUF is yet another innovative product that caters to the young generation,“ stated Ms Nidhi Markanday, Business Head, Consumer Durables & IT, Intex Technologies. The speaker comes in a wooden body with a full plastic panel in the front encompassing certain design elements keeping in mind aesthetics and the look & feel. It is operated via LED display giving consumers the experience of digital FM play. Easy to use, these portable stereos are accessible from a range of up to 7 to 8 meters. The speakers ensure high performance with 100W + 18W output power making them completely performance oriented. Operated through full function remote control, the main units are compact and light weight making the speakers ideal for home or office use.The Cordless MIC function encompasses all modes with digital MIC volume & ECHO control. The latest 4.1 channel speaker, IT-Star 14000 SUF is available at a price of INR 10,500. These speakers will be available through Intex’s vast distribution network across India. Best Budget 2.1 Channel Speaker for PC/Laptop!